Capture screenshot on Windows, Apple Max and Linux. How to capture a screenshot from your screen. Instructions for Windows, Apple Mac, Linux and Android. How to capture screenshot, what screenshots are useful for and how you can capture the screen yourself. Instructions for PC with Windows, Mac but also for your iPhone, iPad or Android mobile. Screenshots are among the most widely used images on the Web today. They are great for writing how-to articles at work, or for reporting program errors to technical support teams. These helpful tips will show you ways to capture great screenshots and get them ready for printing. What is a screen capture / screenshot? Imaging using a photo camera and taking a picture of what you see on the screen. This is called a screenshot or sometimes also screen capture. Luckily you don’t really need a camera for this. Most computer operating systems have built-in functionality to capture screenshots and there are software tools that to do them same with added convenience. How do I capture the screen / capture screenshot / How do I take a screenshot? You can use screenshots to document what is on your screen either for yourself or for others. Not all programs have functionality to print on all their windows / screens. If there is something you need to keep there, then take a screenshot. Capturing is often also used to create documentation for software, to create training materials and to show problems with software. Screen capturing can also facilitate support calls and clarify error reports. Ok, you could actually take a real camera and document what is happening on your screen. The good news is though that Windows, Mac, Linux and Android have free built-in functionality to grab the screen. In Windows you can press the print-screen button. You will not see or hear anything but the screenshot has now captured the screen in the Windows clipboard. If you only want a screenshot of the currently active window, use CTRL + ALT + Print . You can paste the screenshot into Microsoft Word, Excel, Powerpoint or MS Paint by pressing CTRL + V at the same time. Read here how to take a screenshot in Windows 8 metro mode. To capture screenshots on a Macintosh, press the key Cmd + Ctrl + Shift + 3 altogether. This will copy the whole screen to the clipboard. Paste this in any application you want. Press the home button of your iPhone/iPad and the on/off button at the same time. There will be a camera sound and a short animation. Go to your camera roll to see the screenshot you have just taken. There is many flavors of Linux out there. Mostly a combination of Alt +Print , Strg +Print , Strg + Alt + Print should work to capture screenshots. I did not try that yet myself, so let me know if this does not work for you. While there are free built-in screenshot capabilities with most operating systems there is also tools that make taking lots of pictures easier. These tools will let you select more precisely the picture area. You will be able to change the picture size and colors. Adding text and drawing on the screenshot helps to highlight areas of interest. Such a software utility often lets you also email and print the content directly. Starting with Windows Vista there is the free Snipping Tool included with Windows. 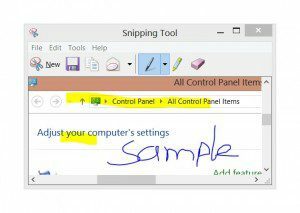 Read this page on where to find Snipping Tool in Windows 10, Windows 8, Windows 7 and Windows Vista.